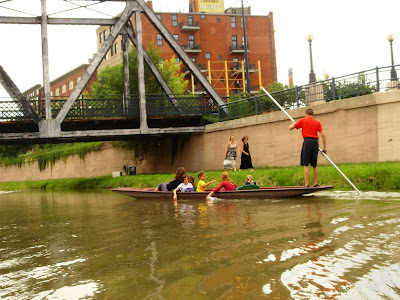 The punts are back on the water of Denver's Cherry Creek. This will be the 12th season for the unique Colorado boat operation, which was known as Punt the Creek until nine years ago when they changed it to Venice on the Creek. 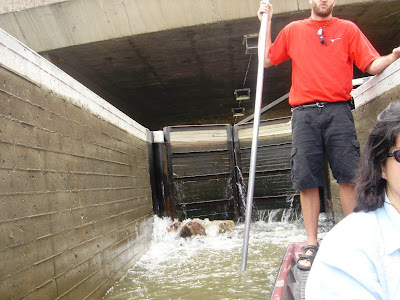 Started in 1996 by former State Senator Joe Shoemaker, this punting operation takes passengers for 45 minute cruises on the Cherry Creek section of the Platte river, passing through Colorado's only system of locks. Joe's son Jeff Shoemaker now runs the the operation, which is not only believed to be Colorado's only romantic passenger-for-hire boat operation, but the only punting company in North America. 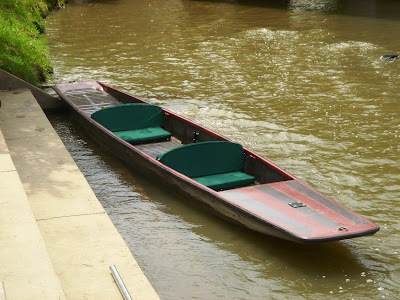 They have five 23' long punts, which were all built in Cambridge, England, and their "gondoliers" push them along with a pole in the same manner that is common in England. I visited the punting operation in August of 2004 with my family. The experience was similar to gondolas in some ways while totally different in others. Our punter let me climb up on the back and try my hand at punting. It was embarrassing at first, but I eventually got the hang of it - of course my wife and daughters still laughed at me. So the punts were launched today, and the staff is ready for another great season, taking passengers for memorable cruises.